I had a pretty strange New Years (which I suppose should be expected by now). I wasn’t able to get in touch with the people I actually came out to New York to meet up with but I did manage to meet up with one of my old roommates from college (sounds like something from a preppy movie). I wanted to check out Times Square and the ball drop (since it’s so iconic and all) so I wandered over in that direction around 1o’clock and there was already an ENORMOUS throng of people. There was still some room to get a good spot…if I were that guy that was capable of standing around for 11 hours waiting for something exciting to happen. So, I went wandering in search of excitement and found one of those things that I think is incredible and that precious few others will even care exists. At the New York Public Library they had an exhibit on Jack Kerouac that had the actual scroll that he wrote the first draft of “On The Road” on in 1951. The quick story: Kerouac wrote the first draft of “On The Road” in three weeks on 10 twelve foot rolls of paper that he later taped together with scotch tape. I’ve mentioned Steinbeck’s “Travels With Charley” a number of times but “On The Road” is the only other book I considered bringing with me on this trip so it was thrilling to see the original in all it’s 60 feet of unfurled glory! They had a lot of other interesting artifacts and notebooks but that was the crown jewel. By the time I finished wandering the library it was already 6 o’clock so I headed back over to Times Square to see how things were shaping up. Mostly it had taken the shape of a brick wall made of people. And the last thing I wanted to do was try to walk through a brick wall with a backpack on (if only I were The Flash). Instead I wandered over to Brett “Stacy” Turner’s house thinking I could drop off my bag and head back over to Times Square later in the night…and I did…kinda. The next time I went to Times Square it was already 2am and it was like something out of “Mad Max” Assuming Mad Max took place in a deserted wasteland full of confetti and a few straggling Grey Goose brand zombies. 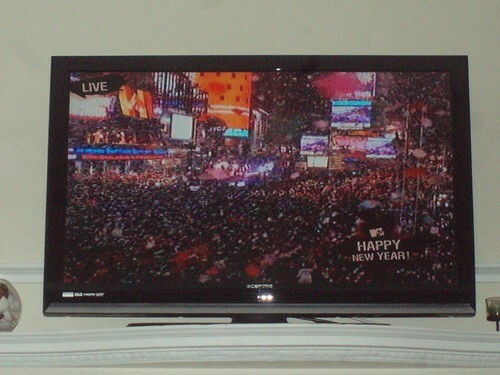 Still I feel I got a pretty good idea of what a New York New Year’s is all about. PLUS, 2008 is already shaping up to be an incredible year! Looks like I’m going to be able to cross #22 off the list tomorrow thanks to Fox News! Can’t wait! I’ll update with details as soon as I know more. I heard about that scroll. I’d really like to see it, too! Fox News, huh? Can’t wait to hear details. Dude. (And by dude I mean: Jill.) That was one of the coolest things I’ve seen in all of New York. Totally, exciting.